Kansas City is for racing. Whether you are a veteran runner looking for a new distance to try, or even a newbie seeking out your first race, the KC running community has something for you. We’ve come up with a list of our favorite area races in all distances. And if you are like us, your favorite part of running a race is the celebratory breakfast after. We’ve got you covered! Are you team coffee or team cocoa? It’s a hard choice, but if you want to run Battle of the Bean 5K you’ll have to decide. This race is sure to be cold in the middle of January, but you’ll be able to warm up with either a delicious hot cocoa or coffee at the finish. You’ll even be greeted at the finish line with KC’s famous Christopher Elbow Chocolates. Believe it or not, the 1st Annual Battle of the Bean was Jamie and Brittney’s first race together, and Jamie won by 0.1 seconds. She’s a stud. Urban Table offers an amazing brunch selection and is just a few short blocks away from the race. Featuring items as simple as steel cut oats, to the more adventurous grilled donuts to breakfast tacos, you’ll have lots of options to help restore your glycogen stores lost battling for your favorite bean. Cup of Joe: Foo’s Fabulous Custard No need to go far! Walk into Foo’s Fabulous Frozen Custard from the race finish line. They serve so much more than just frozen treats! With a full espresso bar and plenty of local treats available for sale, your heart & belly will be content. If you still need that custard fix, order the latte blended with a scoop of their custard in place of the milk, it’s as amazing as it sounds. 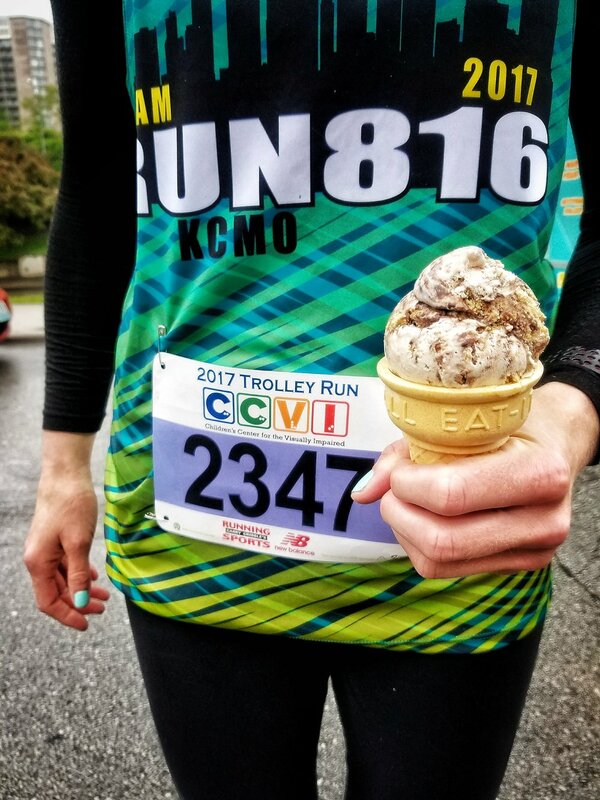 A KC tradition for almost 29 years, CCVI Trolley run is one of the nation’s largest 4 mile road races and is sure to make you feel like a speed demon. With a net loss of almost 150 ft over 4 miles, you’ll be flying through Waldo and Brookside to get to the finish line on the Plaza. It’s a great race for anyone new to racing, or for anyone looking for a speedy PR. The Trolley run benefits the Children’s Center for the Visually Impaired. Several visually impaired runners run this race, and you can even sign up to be a pace buddy for a visually impaired runner. Trust us when we say the post-race food provided at The Trolley run is out of this world, because it is. The amount of food and festivities at the finish are unreal. The Betty Rae’s truck was at the 2017 finish line. Need we say more? If you find yourself craving more, (because really who doesn’t?) get yourself a table on the beautiful patio at Gram & Dun and enjoy some brunch while you watch all the runners come in! Their cinnamon roll has espresso orange caramel in it. That’s reason enough. Not far from the Plaza finish is the most adorable coffee shop you ever did see. Hi Hat coffee, although closed on Sundays (race day), can’t go without mentioning. Enjoy any one of their house-made syrups and drinks on their amazing patio that sits outside the tiny Tudor style shop. Your heart will be so happy. Maybe swing by after packet pick up on Saturday to shake out any pre-race day jitters? If you’re looking for a crisp fall run with beautiful fall foliage, check out the Cliffhanger Run. Offering a 5k or an 8k, the course runs along the iconic Cliff Drive, designated as an American “Scenic Byway” in the historic Northeast. The Cliffhanger Run is a beautiful race that will not disappoint. An added bonus is the downhill finish. Feeling fast at the end is always appreciated. Check out the post-race (free!) pancake feed that follows the race. Mingle with the runners, eat some pancakes and see if you won anything at the award ceremony. If you find yourself wanting more to munch on, head over to Pigwich in the East Bottoms. With a small menu and rotating daily specials, you’re sure to find the right sandwich to cure those post-race cravings. Eleos Coffee is an adorable coffee shop in the Northeast on Independence Ave. They have a plethora of house made syrups that are anything but ordinary and combine beautifully with your espresso. This quaint coffee shop seeks to do good for its community and will leave you with all the feels. The 10K is such a great distance. Long enough to feel like you’ve really accomplished something, but not so long that you’re out of commission for the rest of the weekend. The Plaza 10K falls on a Sunday in September and the weather tends to be perfect. The race is a local favorite and the course is known to be flat and fast, a perfect race for those seeking a PR. Refuel after your run with a fresh juice or smoothie at TLoft, just down the street from the finish line. The menu also includes a range of healthy breakfast bowls like the savory Sunrise Scramble, a mix of eggs, chicken, and veggies or sweet options like the Blueberry Almond Quinoa bowl. Don’t forget to pick up a few protein balls, a runner favorite. Whatever you choose, TLoft will leave you feeling amazing. This cozy neighborhood spot is located just east of the Plaza and is the perfect spot to sip a cup of joe and find some post-race comfort. The espresso drinks are expertly crafted and the baked goods are made in-house. A traditional cappuccino and handmade smores pop-tart are the perfect treats to nosh while you plan your next big race. Rock the Parkway is Kansas City’s coming out party. We’ve spent the winter slogging away on the treadmill or facing the brutal outdoor elements. Now we are ready to reap the benefits of all of our hard winter-work with a beautiful Spring race! Rock the Parkway starts in South KC and runs along Ward Parkway, through iconic Brookside neighborhoods, and around Loose Park. Cheering fans line the course, adding to the party-like atmosphere. Cross the finish line and you will instantly be transported into the celebration of live music and runner-favorite foods. Head north to the Waldo neighborhood for the ultimate post-race reward: brunch. 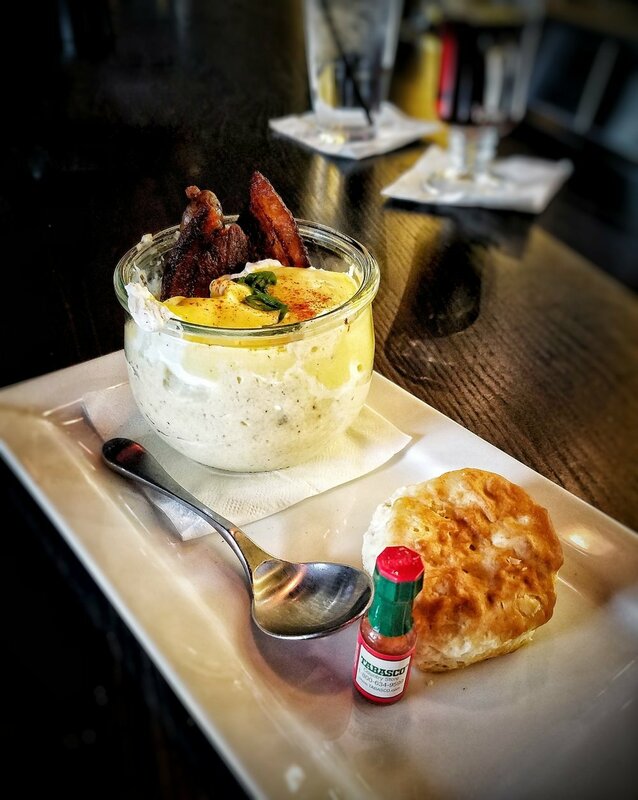 You’ll find all of your standard breakfast fare like jalapeño cheese grits, brioche French toast, and the ultimate omelette. If you are looking beyond breakfast, try something from the lunch menu like the Summit Grill Burger or the steak street tacos. Summit Grill will satisfy whatever craving may have hit you after running 13 miles. We can’t hide our love for Second Best Coffee. Their menu changes with the seasons, so you can expect an array of Spring-inspired beverages for your post-race celebration. If you can’t decide on just one, choose a flight of three. You’ll fall in love with the crazy combinations! It’s the big dance, the one you must attend. Whether as a runner, volunteer, or spectator, the KC Marathon is a day you’ll want to be a part of. The race occurs in mid-October when the air is turning crisp and the trees are in the midst of all their autumn glory. 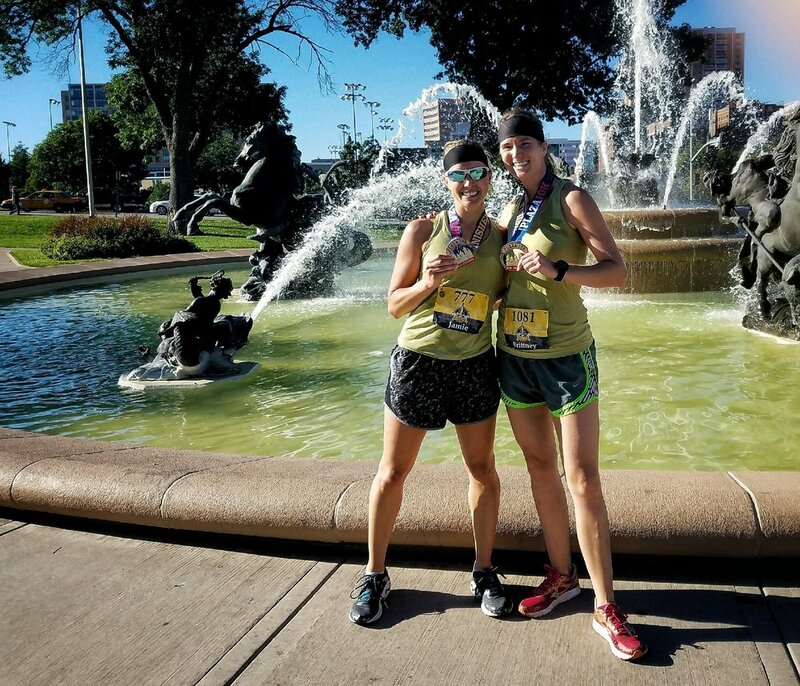 The Kansas City Marathon is the perfect tour of the City of Fountains. Starting in the heart of Crown Center, the race will give you an up-close look at the Liberty Memorial, run through cheering crowds in Westport, into the Plaza, and through some of the city’s most idyllic neighborhoods. Cross the finish line and you’ll be rewarded with some of Kansas City’s best: namely, beer and barbeque. If you still have room after all of the post-race beer and BBQ, head toward Southwest Boulevard for breakfast at one of Kansas City’s best-kept secrets. The Mixing Bowl Noshery offers all of the standard breakfast fare, cooked from scratch. Reload your carbohydrate stores with a stack of their famous buttermilk pancakes. Light and fluffy, they taste just like wedding cake. Go ahead and order the tall stack, you’ve earned it. The newest addition to the Westside neighborhood has quickly become a favorite of Kansas City coffee lovers. The charming shop offers all of your favorite espresso drinks, piping hot or iced cold. Goat Hill takes refreshments to another level by offering craft sodas and snow cones in a variety of ever-changing flavors like Spicy Ginger Fizz and Blackberry Lavender. It’s the perfect treat after all those miles spent on your feet.